Grain free dog food is food without grains such as wheat, rice, corn (maize). By feeding your dog a grain free diet it can help to reduce symptoms such as loose stools, chronic licking, scratching, itchy ears and skin. These can all be a sign of grain intolerance / sensitivity. 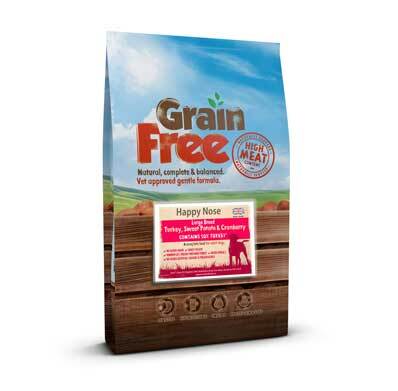 Carbohydrates such as Potato and Sweet Potato are used in our Happy Nose Grain Free ranges as an alternative to grains, they provide slow releasing energy which help keep your pet fuller for much longer.